Small and lightweight with multiple carry options. This is a great choice for survivalists and bushcrafters. 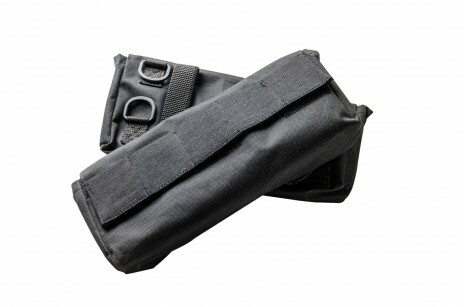 This lightweight, portable, ballistic nylon pouch is perfect for emergency kits either by itself or as a specialized pouch to be added to a larger kit. For example, it's great for use as a medical kit, a handgun/ammunition kit, a knife kit, or a fire starting kit. The bag has multiple options for carry. It can be worn on a belt, attached to a pack, or fit inside a larger container. Inside, there is a divider with multiple elastic loops and Velcro. There are also Elastic loops on the outside perfect for clipping on additional items. The price listed is for the bag only. There is not a pre-made kit for this item. It is 10.5" long, 4.25" wide, and 3.5" deep.